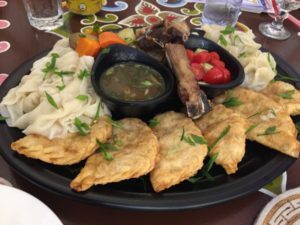 During our stay in Mongolia we loved Mongolian food. Most typical dishes consist of sheep meat and potatoes … not very dietary. But we must remember that in this region of the world where temperatures easily reach -20 degrees in autumn and winter, it is difficult to grow vegetables or fruits. 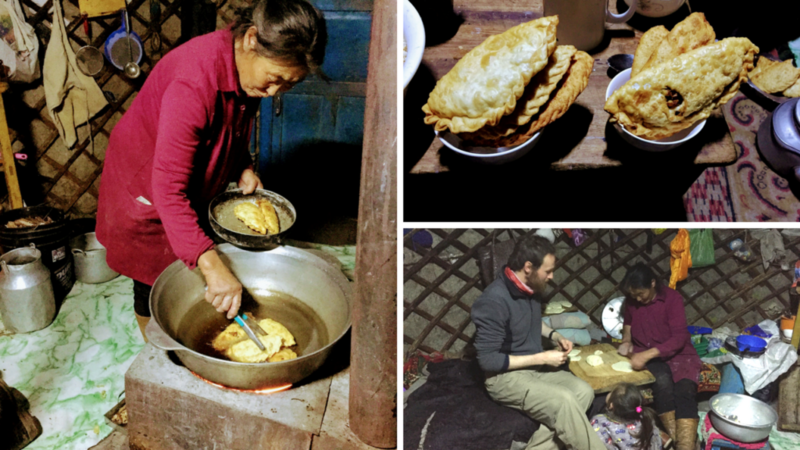 – Optional: our hostess during our stay in Mongolia also added cooked cheese. – And oil for frying. Prepare the filling by mixing the minced meat, onion and garlic (and cheese). Add water until the mass is smooth to be worked. Then, mix the flour and water to create a soft dough. Let it stand for 15 min. Cut the dough into slices 3 cm thick, roll the slices. Then cut the rolls just into 4 cm pieces, and flatten the pieces with one finger. The pieces of dough are rolled in a circle about 10 cm diameter. Place about one and a half teaspoons of meat on half a circle then close the circle by folding the ends over to cover the meat. Press and form small loops on the edge of the Khuushuur to give it its particular and authentic form. The Khuushuur can now be immersed in oil until they take on a pretty golden color. 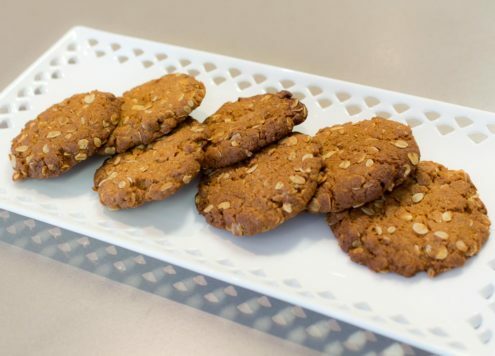 You can serve them with vegetables.